For plaster and plaster board drill or punsh hole in ceiling to same diameter as the closed flaps of toggle. Insert flaps and bolt assembly with the toggle bolt protruding through. Lock the assembly by screwing on hook. 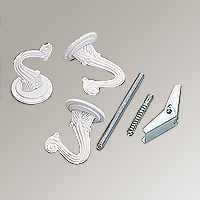 For wood ceiling and beams, screw steel screw into hook. Then screw the assembly into the wood.